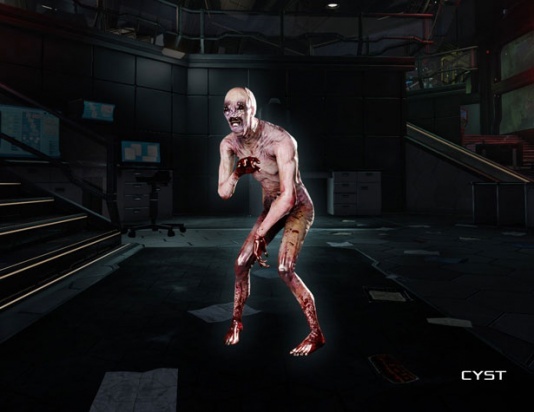 The Cyst is a common specimen in Killing Floor 2. It is classified as a lesser enemy, and therefore, cannon fodder. 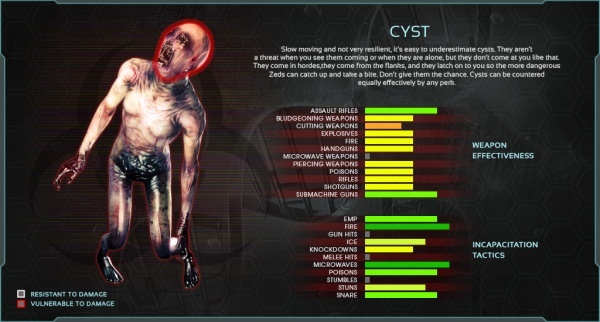 Cysts are generally considered to be the weakest specimens in the game, whose only purpose is to populate the level. Cysts move slowly when docile, and sprint when enraged. On higher difficulties, Cysts have a chance to enrage upon sighting the players, and have a chance to enrage when shot. Once enraged, Cysts will never stop sprinting until they are killed. Cysts have little to no weaknesses, and have a few crippling resistances. Cysts have no resistances to ballistic weaponry and are extremely vulnerable to sub-machine guns. Cysts, unlike alpha clots, have 1.5x vulnerability against assault rifles. Tested results with testmap. Cysts only have one weak spot, which is the head. 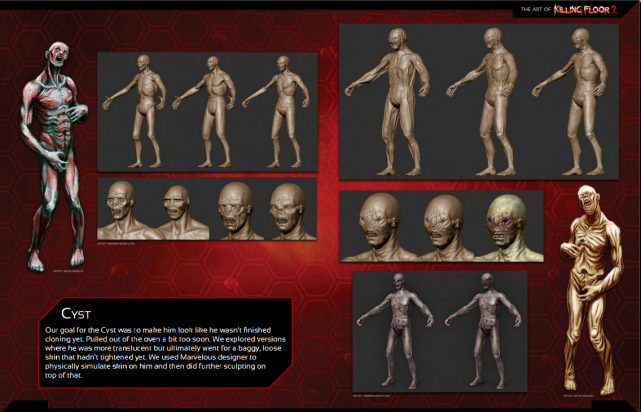 Cysts are the weakest ZEDs in the game, being extremely slow to move and attack. 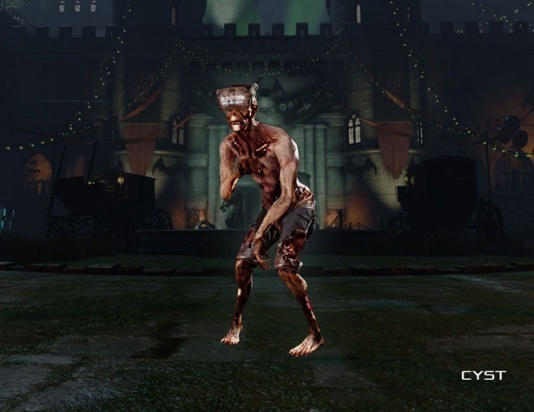 Upon spawning, it will walk or sprint towards the nearest player and attempt to scratch them, or grab and bite them, immobilizing their target. Cysts behavior does not change drastically between the difficulties. (PvP) Rally boost: forces AI Cysts to sprint. Damage to doors (possible values) = 18 / 36 / 48. Cyst cannot grab the player for 1 second after grenade throw. Cyst cannot grab the player for 0.5 seconds after shooting the healing dart. Cyst has a chance to evade certain damage sources. In later waves, Cysts are there to populate the waves and distract players from larger threats. Try to take them out quickly so you can focus on the real threats sooner. Extremely weak to Sub-machine guns, making the SWAT the best perk for quickly exterminating huge groups of Cysts. Beware of their grabs, as Cysts can end games by catching the last surviving player off-guard and immobilizing them, giving the larger enemies enough time to catch up and kill them.